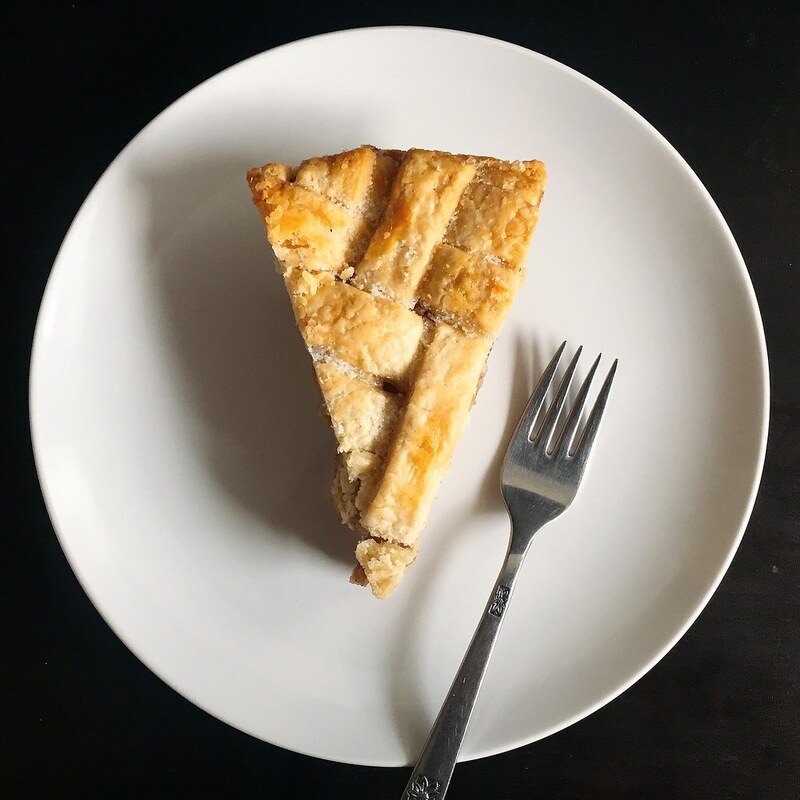 Food52 started its cookbook club this month, and the inaugural cookbook was Kate McDermott's Art of the Pie! I thought it was an interesting choice because it's the dead of winter here in New England, and I usually think of the summer and fall as better pie-making seasons. But I was able to get a copy of the book from the library so I figured I'd take a look and see what might inspire me. The first pie I tried was the Banana Rum Caramel Coconut Pie because, while there were several components to the pie--a blind baked pie crust, bananas, rum caramel, rum pastry cream, and toasted coconut chips--I actually already had all the ingredients! Personally, I thought the pie was too sweet, but it didn't stop me from trying a couple more pies from the book. Since I had a bunch of egg whites leftover from rum pastry cream for the previous pie, I decided to try my first lemon meringue pie. 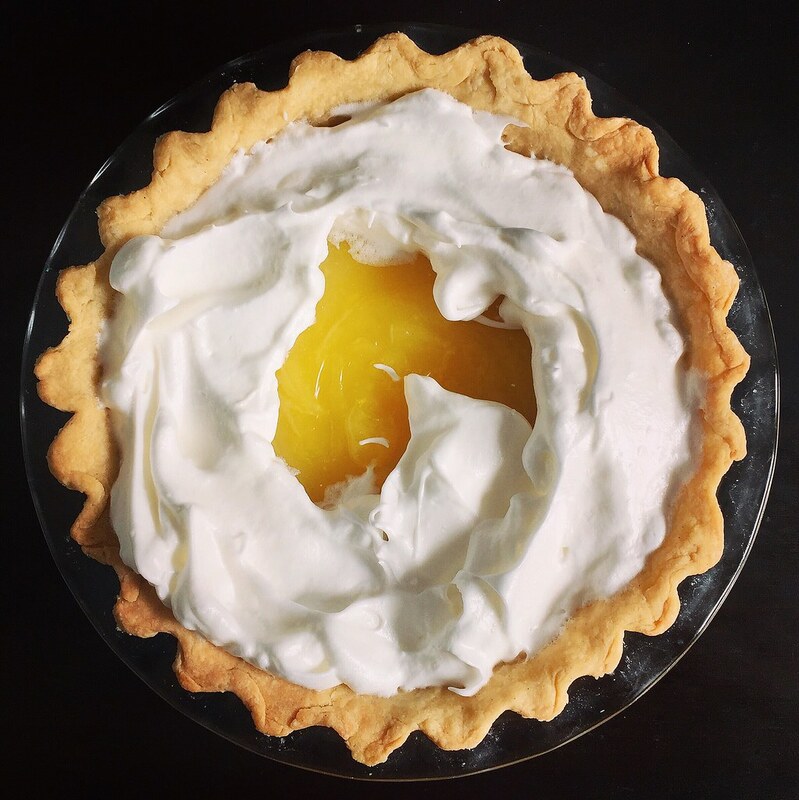 While the pie tasted great, I had issues with the meringue weeping even after following all the directions from the book. I was also a little confused with the direction to "pull up some soft peaks with the handle of a spoon". I got little itty-bitty peaks whereas I would've preferred larger waves. If I ever make a meringue pie again, I'll probably just use a spatula to do that. 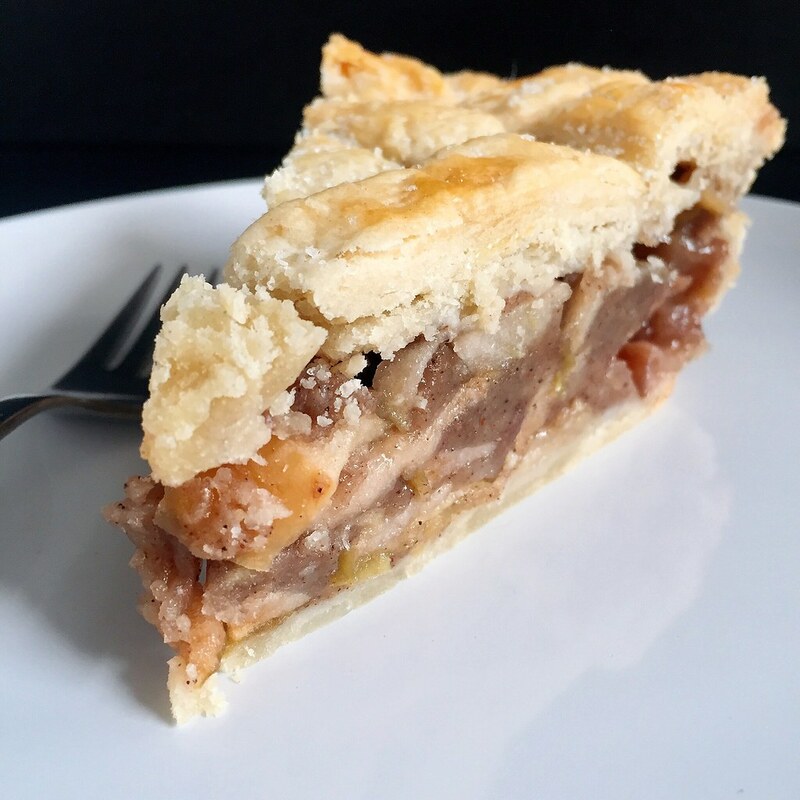 My favorite pie that I made from the book was the Quintessential Apple Pie. Kate's preferred pie crust is one made with butter and leaf lard, but since I didn't feel like sourcing any leaf lard, I turned to what I already had in my freezer: bacon fat. It was definitely more malleable than the butter even when chilled, but I think it made for a wonderfully flaky pie crust with a subtle bacon flavor. For the filling Kate suggests using a mix of sweet and tart apples, so I used a blend of Gala, Fuji, Golden Delicious, Macintosh, Cortland, and Red Delicious apples. She also wrote that you don't need to peel the apples if the skins are pretty thin, so I nixed that time-consuming step. 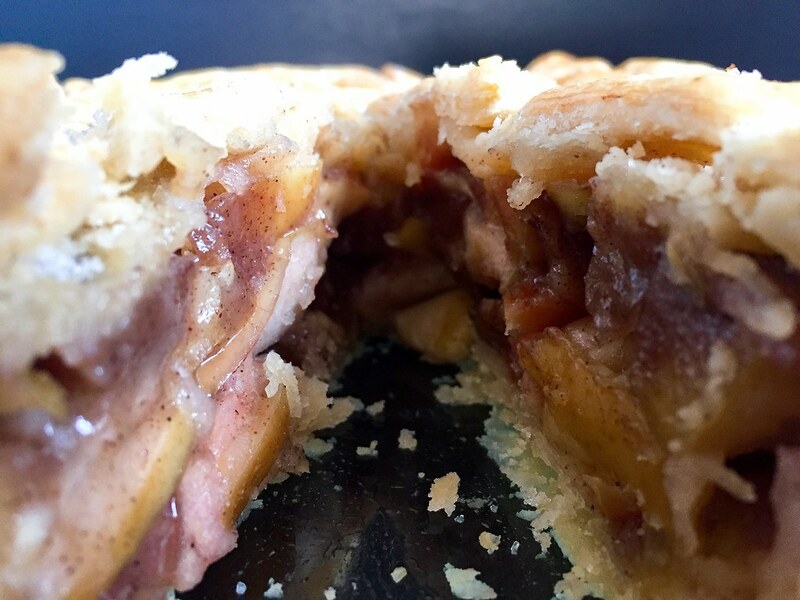 She was right; the inclusion of the apple peels didn't really make a difference in the texture of the cooked filling and may have even improved the taste with their tannins. And since I've been eyeing Serious Eats' herringbone lattice crust for a while now, I decided to try it on top of this pie. 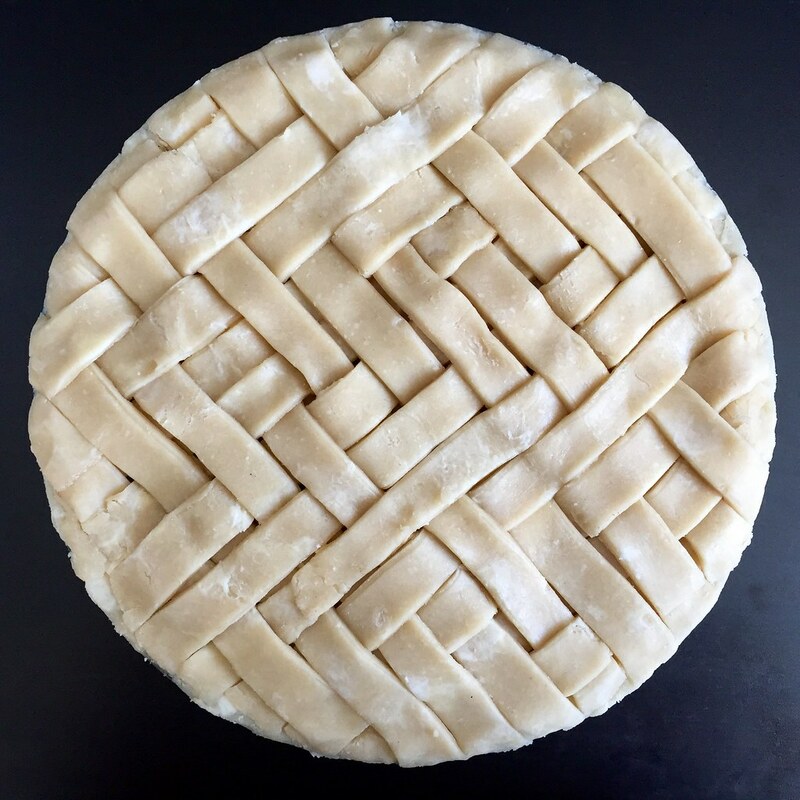 It was actually my first time making any sort of lattice pie crust! I was pretty pleased with the result even though I did mess up the pattern. 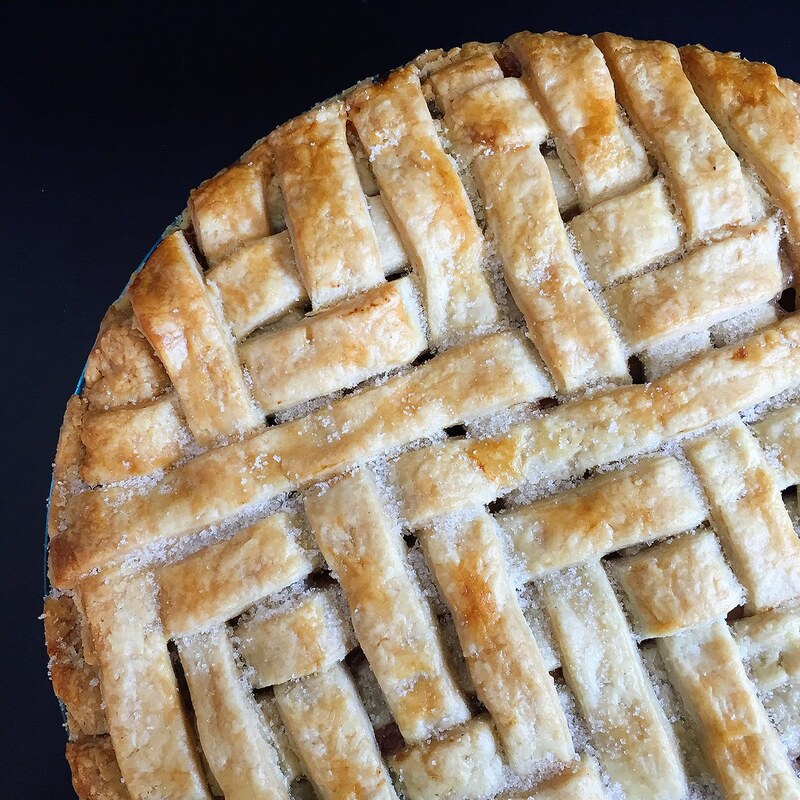 Because you want the filling to be quite flat before laying the herringbone lattice on top, I decided to pre-cook the apple pie filling which reduces the volume ahead of time and prevents the dreaded gaping hole between the top crust and filling after baking. Cut the bacon fat and butter into tablespoon-size pieces. Place the bacon fat, butter, flour, and salt in the bowl of a food processor and pulse 15 times. Add 1/4 cup of the ice water and pulse 10 more times. Add the remaining 1/4 cup of ice water and pulse 5 more times. Dump the contents into another bowl and use chilled hands to bring the dough together. Divide the dough in half and place half in the fridge. Place the other half on a floured surface and cover with plastic wrap. Roll the dough out to 1/16" thickness and an inch or two larger than your pie pan. 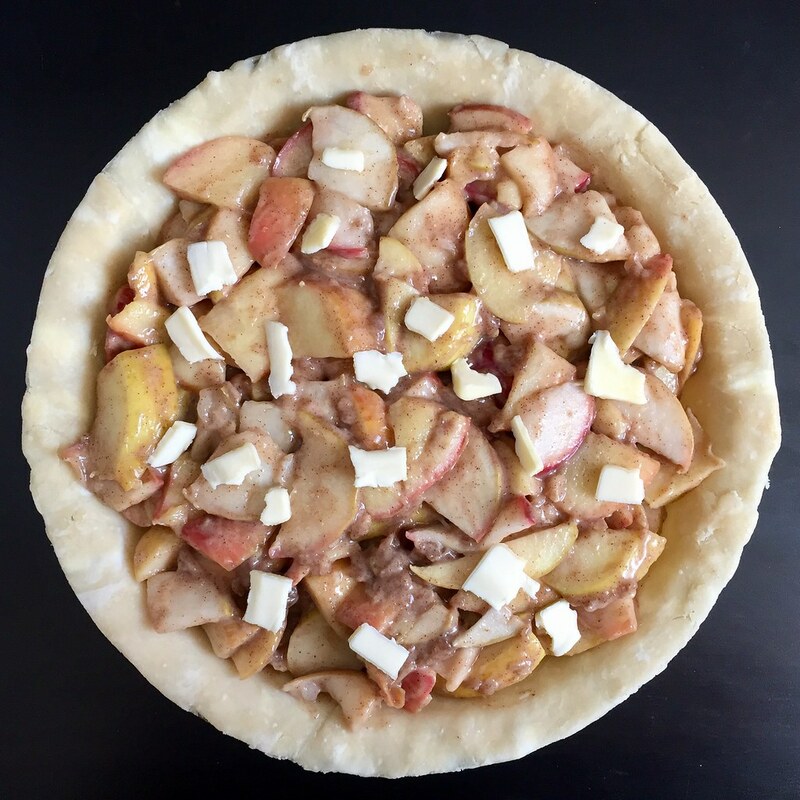 Carefully transfer to the pie pan, trim the edges, cover, and let chill in the refrigerator. Add the excess trimmings to the other half of the pie dough that was already chilling in the fridge. Leaving the skins on, slice the apples and mix with the sugar, salt, cinnamon, nutmeg, and allspice. Cook in a large pan over medium-low for about 15 minutes, just until the juices start to flow. 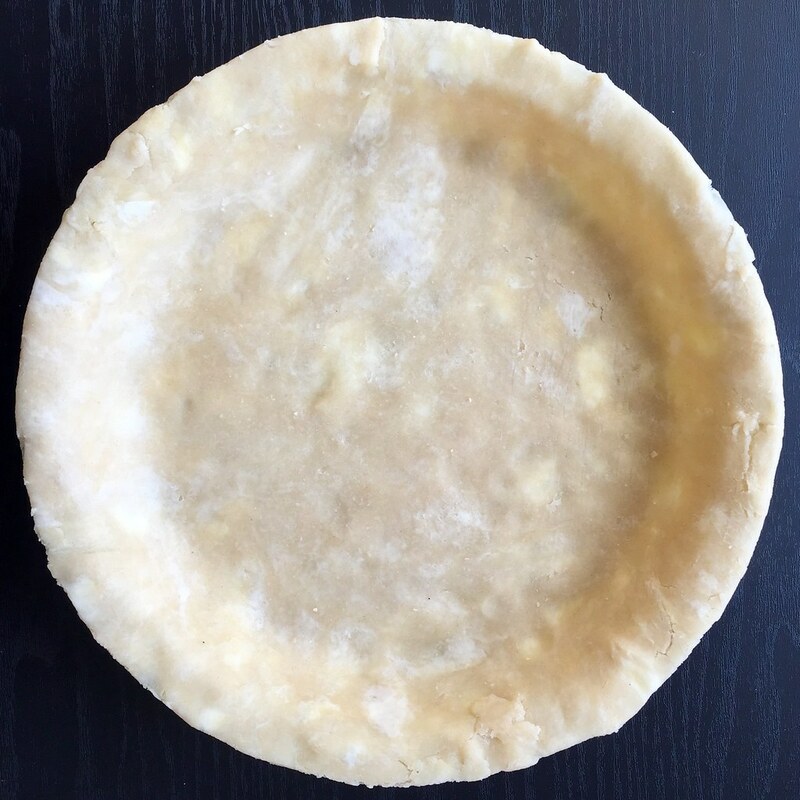 Toss with the vinegar and flour and let cool completely before filling the pie shell. Dot the top of the apples with the small pieces of butter. 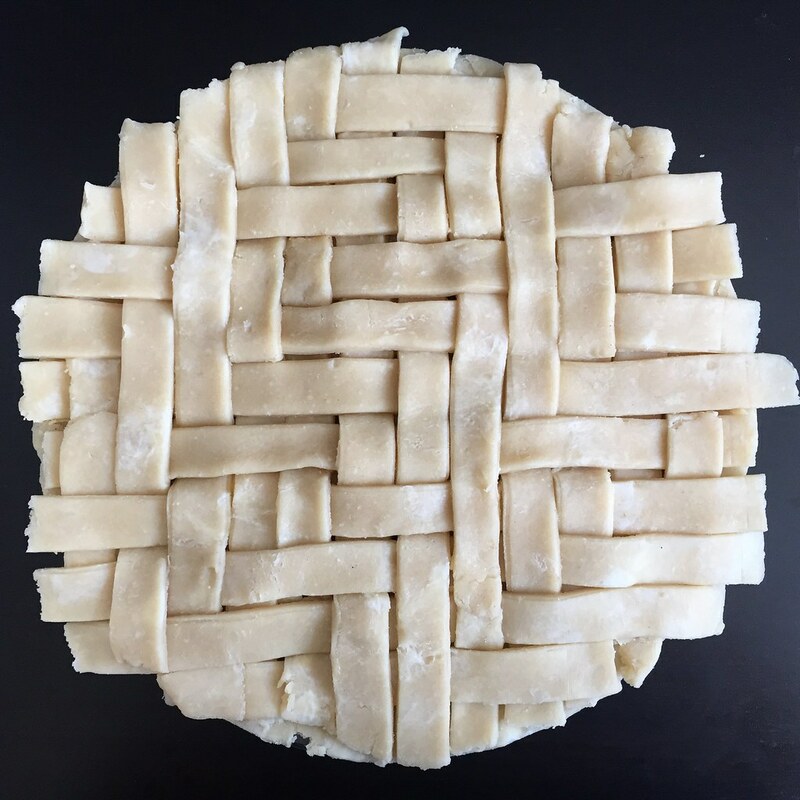 If you want to do the herringbone lattice, follow the directions from Serious Eats. Otherwise, roll out the other half of the dough and top the pie, cutting a few vents on top. Trim the excess dough and crimp the edges. Cover the pie and let it chill in the fridge while you preheat the oven to 425°F. Mix the egg white with 1 tablespoon of water and brush on top of the pie. Bake for 20 minutes, then reduce the heat to 375°F and bake for another 40 minutes. Cool the pie for at least an hour before serving. 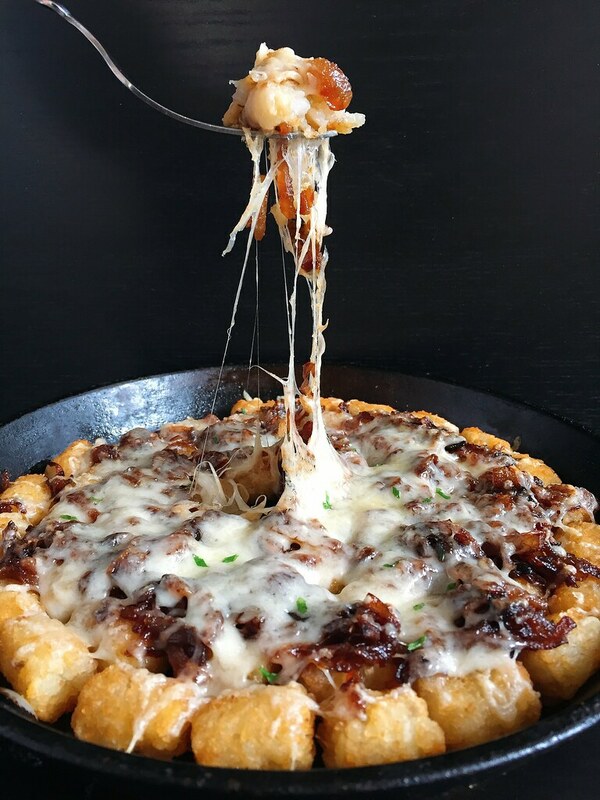 I had a good handful of Gruyere cheese leftover from making zucchini pizza the other day but no more squash so I was trying to figure out a good way to use it up. 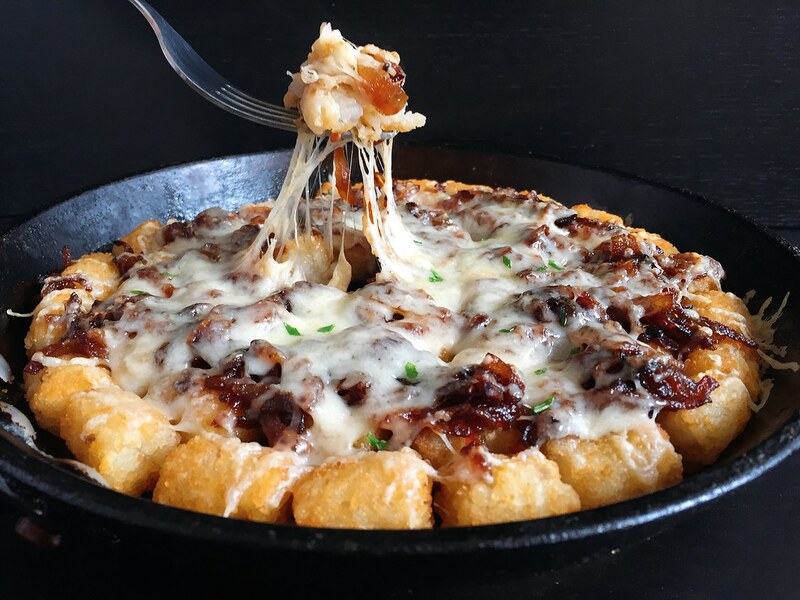 I considered sprinkling it over some fingerling potatoes that I had gotten in my Boston Organics delivery, but then I had an eureka moment and decided to make French onion tater totchos! They're French onion because I caramelized onions and then deglazed the pan with sherry and beef bouillon. 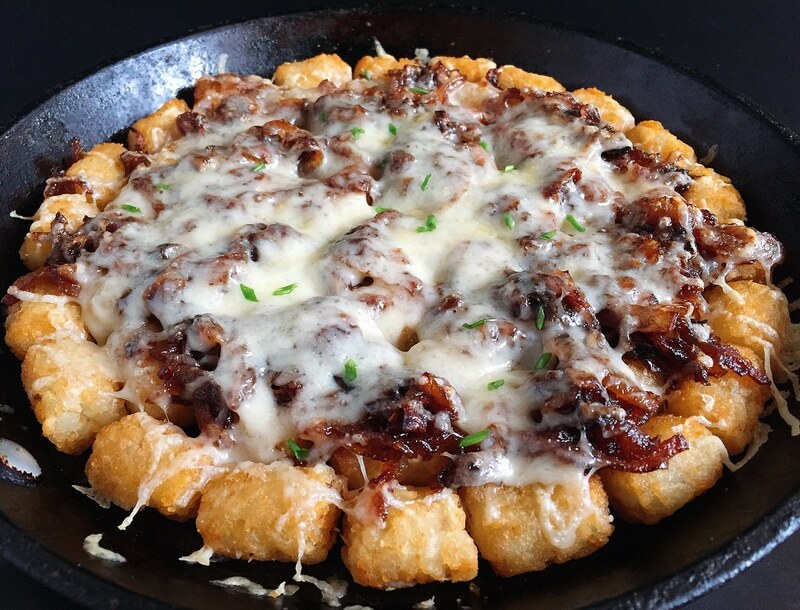 They're totchos because it's melted cheese and other toppings on top of tater tots that you'd eat like nachos. But whatever you want to call them, they're amazing. 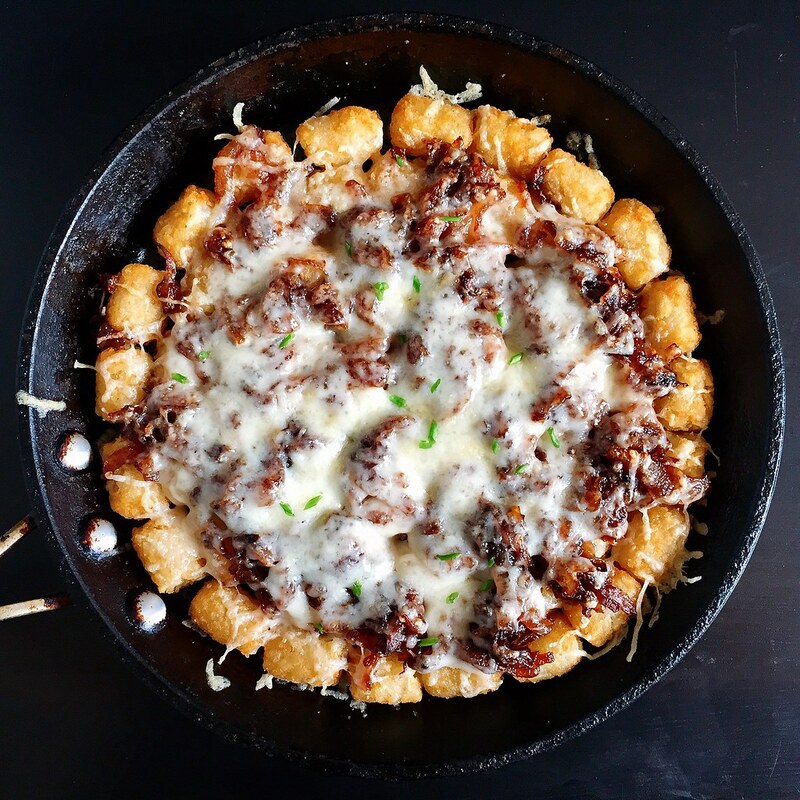 I ended up using a 10" skillet to bake the totchos in, but you could use another similarly sized pan or even double the recipe and make this in a sheet pan. Using a full bouillon cube in the recipe as is makes a pretty salty dish, so if that's a concern for you, you can use half a cube; I was just too lazy to try to halve the cube myself. 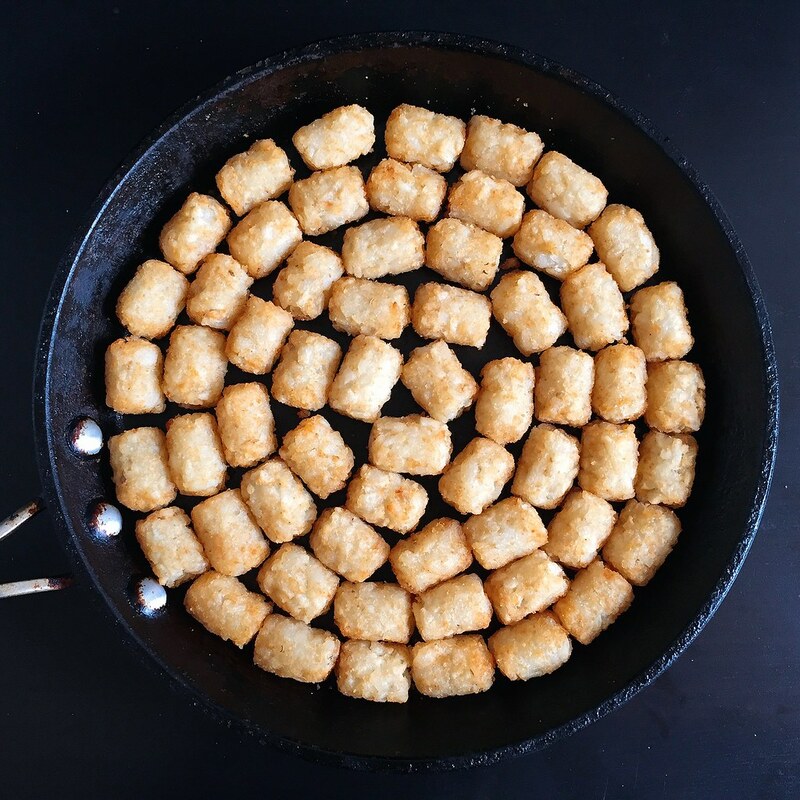 Arrange the tater tots in a single layer and bake according to the instructions on the bag. While the tots are baking, dissolve the bouillon cube in the sherry. Heat a large nonstick pan over medium-high heat and add the onions. Start cooking them without any butter until they dry up and start to color. Turn the heat down to medium-low, add the butter, and continue cooking until the onions are soft and evenly browned. Add the bouillon-sherry to deglaze the pan and continue cooking until most of the liquid is gone. When the tater tots are done, remove from the oven and set the oven to broil. Top the tots with the onion mixture and then the shredded cheese. Broil for a few minutes until the cheese is nice and melty. Serve immediately.